Humana and ADPP-Mozambique have been activated in the province of Gaza a program of emergency aid to people affected by the floods that devastated this region during the month of January. Around 340,000 people live in this area. Of these, about 200,000 have been affected by heavy rains. A total of 140,000 people have been displaced while the death toll is 114, according to the latest UN figures. 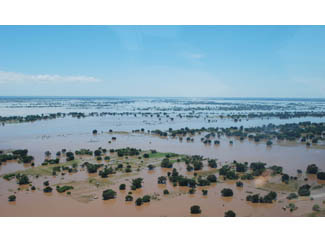 This organization works with the Mozambican government to alleviate the damage of natural and human disaster caused by floods. 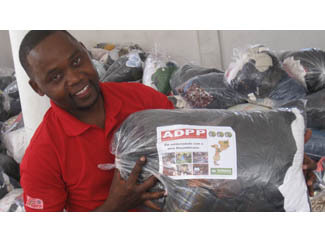 ADPP-Mozambique has begun the classification of the 60 tons of clothing and shoes donated by the Foundation. These 60,000 kilograms of textiles will become 10,000 packs to be distributed in the coming days among the affected population. Also being carried out other actions, such as improved sanitation, latrine construction, cleaning or seed distribution. Humana and its local partner in Mozambique launched this aid program after meetings with other NGOs and government departments dealing with emergency situations and natural disasters. ADPP-Mozambique is developing several projects in this province, in the areas of education and prevention of communicable diseases, mainly. Currently has a School of the Future Teachers and 8 TCE areas, where 400 field officers work. All of them, together with teachers and school students are participating in actions to help people.